This exclusive section of the program offers a basic forty Modern Standard Arabic lessons for starters with examples and short summaries. This window also maybe used for general review as well. Learn the elements of the Arabic sentence and how to structure them properly. 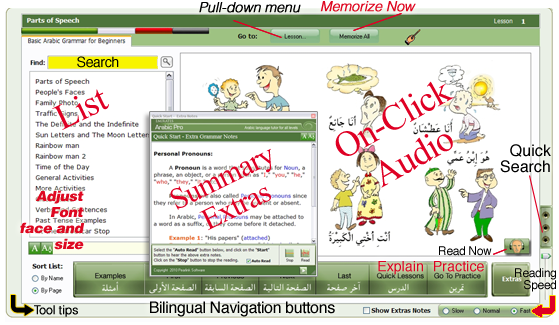 Take a short quiz, practice translation, and respond to questions and answers. This section helps to improve speaking and grammatical and writing skills for levels 1 and 2 students. It is short and concise. You may like this section for classroom activity as well as for home schooling.